We do get asked often if we see women that are not pregnant, men or grandparents. The answer is YES! We are whole family chiropractors located in #aledo and see the entire family. @drdarcygoode here actually sees animals too 💕. Do you have a wellness goal for the new year for you and your family? Majority of our families here at #thechiroplaceformommyandme choose chiropractic as their backbone to their health routine. Make sure to give us a call or DM to get your appointment scheduled now. January is already filling up! The winter holidays are here and you’re pregnant this time! With the festive season comes get-togethers with family and friends and that can mean traveling. If you find yourself on the road or in the air, do some advance planning and get ready for a break in your normal routine, lots of activity, and the unexpected. The idea is to enjoy the travel and visiting and eliminate as much of the stress that can come with celebrating away from home when you’re expecting. ● Create a pregnancy travel contact list. If you’re close to your due date you’ll probably want to keep your travels closer to home, not too far away from your midwife or obstetrician, birth center or hospital, and other birth and pregnancy health providers. ● Try not to overdo things getting ready. Stay rested. Get plenty of rest before and after arrival. Build in relaxation time. ● Prime your body. Get physically active to strengthen your muscles and ligaments to prevent or reduce swelling; not intense aerobics, but slow, leisurely walks or gentle yoga – for all of the above. ● Eat balanced meals before and while you’re away. ● Get a prenatal chiropractic adjustment before your trip. ● Use essential oils and supplements to boost your immunity before, during, and throughout your travels. ● Create a file on your phone or bring a folder of documents with names and phone numbers of your team of health practitioners. ● Are there any destinations you should avoid? You probably want to stay away from third-world countries or places with fewer health care options and facilities. A good travel agent should be able to assist. ● If traveling by air or sea, check the company’s pregnancy policy. Most airlines won’t let passengers on board after 36 weeks. Cruise lines are often more restrictive. ● One rule of thumb that we suggest for our expecting mothers is if you do travel to an area, are you comfortable delivering at that local hospital? If not, then it is most recommended not to take that chance. This is an example of the 126th favorite reason why we love our clinic being located in Aledo, Texas. With Fort Worth being just a quick drive to the east and Weatherford OBGYN and Associates to the west, we live in such baby- and mother-friendly hospitals. Your options include Texas Health Harris Downtown, Baylor All Saints Hospitals, and Weatherford Regional. Select a suitcase that’s easy to wheel around. Don’t overstuff your suitcase; this can help prevent strain on your back. Pack all your pregnancy needs: vitamins, supplements, first aid kit. For potential morning sickness, nausea, or vomiting, bring along ginger lozenges or ginger or peppermint tea bags. Items to include: comfortable clothes appropriate for the weather, water bottle, travel pillow, eye mask, antibacterial and anti-microbial essential oils (lavender or On Guard oil are good choices), ear plugs, sun hat, sunscreen, compression socks or other supportive, non-restrictive footwear. Healthy snacks are always a must in times of hunger. ● What are the most common pregnancy complications and what do I need to look out for? ● What medicines and supplements are safe to take (for examples, heartburn, constipation, food poisoning, traveler’s diarrhea)? ● What should I do if I think I might be miscarrying? ● What activities should I avoid? ● Take frequent breaks to walk and potty. ● Drink lots of water. ● Wash your hands frequently. Use natural hand and face wipes when you don’t have access to water. We personally love the On Guard sanitizer spray pen or the Honest Company natural sanitizer spray. ● Carry natural wipes in your handbag when using public toilets. ● Avoid foods and beverages you’re unfamiliar with and on your “no-no” list at home. Keep your diet as close to your regular diet as possible. Seatbelts. Wear your seatbelt at all times in vehicles. In the event of an accident, it can keep you and your belly from hitting the dashboard. The National Highway Traffic Safety Administration advises the shoulder belt be placed over the collarbone and across your chest and the lap belt as low as possible on the hips and under the abdomen – never over your belly. Airbags. Keep them on. Leave at least 10 inches between your breastbone and the steering wheel to avoid risking an injury to your ribs and belly in the event of a collision … the recommendation of the American Congress of Obstetrics and Gynecology. Select a taxi or Uber over a crowded bus to make connections to your final destination and outings. Get up and walk for about 15 minutes about every two hours to avoid swollen feet and an increased risk of blood clots in the legs. Perform some stretches. You can do some stretching without leaving your seat but make sure to get out often to walk around as well. Carry a big water bottle to stay hydrated. Avoid convenience store junk foods. Pack your own healthy snacks. If all you have access to is a convenience store and you want a snack, opt for an apple, banana, nuts or seeds, and pure juices without added sugar if you are hankering for something sweet. Some of our favorites are pure coconut water for their natural electrolytes and a string cheese or a bag of unshelled pistachios. ● For long flights, fly first class or business class if your travel budget can handle it. The seats are wider and you get better service. ● Be in the best position to keep aches and pain to a minimum while traveling. Sit in the front section of the airplane, if possible; it’s roomier and less turbulent than the back. You’ll also be able to get on and off the aircraft quicker. ● Consider an aisle seat for easier access. Sometimes a window seat can alleviate nausea. ● Stretch your legs and get up out of your seat. You’re more restricted in an airplane, so if the flight is long, get up as often as possible and make trips to the restroom or walk the aisle when permitted. You’re all set! Go have fun and relax! 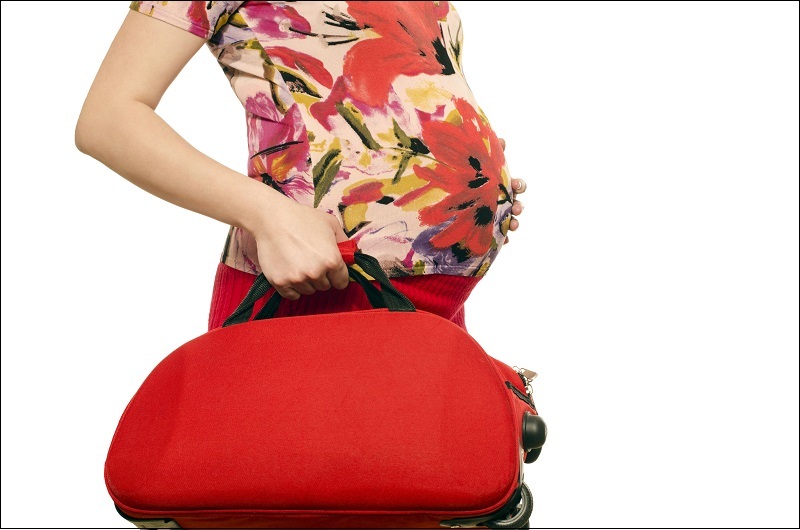 See your local pregnancy chiropractor again when you return to help fix any trip-related aches and pains. We are Doctors Michelle Parker and Darcy Goode. Our clinic has been certified in Webster Technique and providing care to pregnant women and children since 2010. Webster Technique is a specific chiropractic analysis and diversified adjustment to help address any imbalances within the musculature or bony structures of the pregnant woman’s pelvis. Both of us have numerous post-graduate chiropractic training in working on the muscles and bones of expecting moms and newborns by integrating craniosacral therapy, myofascial release, and pregnancy-tailored chiropractic adjustments. 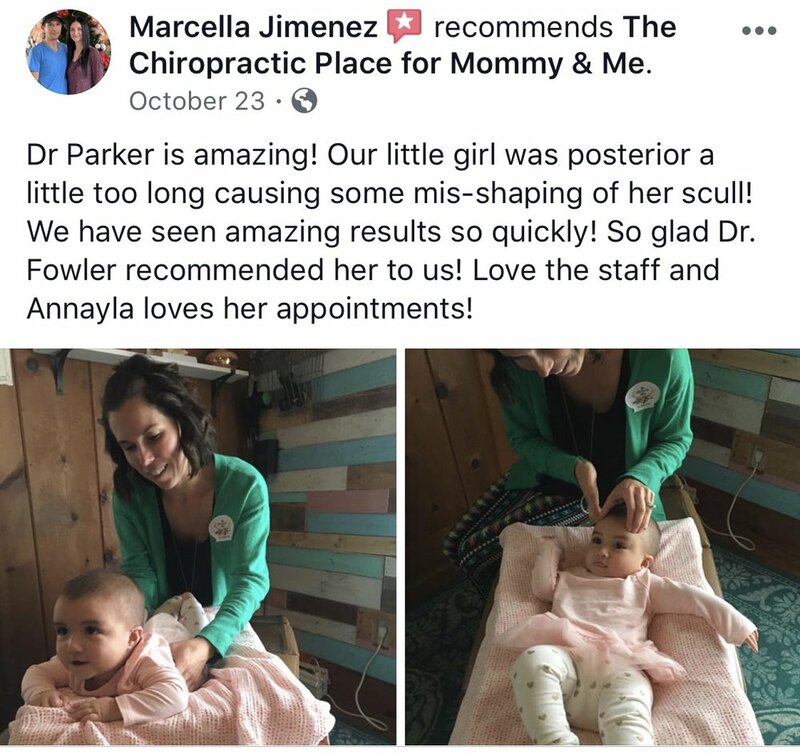 The office of The Chiropractic Place for Mommy and Me is in Aledo, Texas, just 15 minutes west of downtown Fort Worth or 10 minutes east of Weatherford, Hudson Oaks, and Willow Park. Feel free to visit our social media pages on Instagram @TheChiroPlaceforMommyandMe or Facebook @TheChiroPlace to get a feel for our atmosphere and how we work with pregnant moms, mothers, and children. We are proud to offer a family-friendly, kid-approved, and mother-oriented space to the community. Give our office a call to get your baby’s appointment scheduled today at 682-214-0408. Did you know your spine is made up of 33 individual bones, called vertebrae. They are stacked one on top of another to form what is called the spinal column. These vertebrae are numbered and divided into sections: cervical (neck), thoracic (mid back), lumbar (low back), sacrum, and coccyx (tailbone). Lots of breastfeeding support rolling out for November in Parker County - Golly. Can you believe that it is already November? Join us for our free motherhood community support group at our lunch and latch inside the Aledo Community Center Wednesday, November 7 & 21 from 12:30-1:30 with IBCLC (International Board Certified Lactation Consultant) Dewlene Broyles with Mom Support + Dr. Michelle Parker with The Chiropractic Place. The only Latch Clinic in Parker County is hosted by Doulas of North Texas in Aledo, Texas on Friday, November 16th 9:00-11:00 with IBCLC Heather Martin with Beyond the Breast + Dr. Michelle Parker. This is a mini-clinic experience for any mother breastfeeding + chest feeding or bottle feeding expressed breastmilk that has questions and guidance on what to do next. Visit http://tinyurl.com/finessedfeedingclinic to reserve your spot today. As always, if you are a breastfeeding mother that is experiencing any type of pain or discomfort while you are nursing your newborn or infant and have been seen by a lactation consultant, pediatric chiropractic may help. Here at The Chiropractic Place for Mommy and Me, Dr. Michelle Parker + Dr. Darcy Goode integrate their specialized training in dynamic body balancing with their tailored pediatric chiropractic touch. This combines craniosacral therapy, myofascial release and gentle chiropractic. Sometimes a newborn or infant may be experiencing difficultly latching onto mother’s breast or the bottle because of underlying muscle tension or imbalances within their cranium or spine. Call The Chiropractic Place today to get your baby set up for their first baby chiropractic appointment.